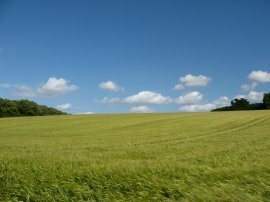 I did this walk on Sunday 29th June. On this stage of the walk I was accompanied by my friend Dave, which again was very welcome. Not only did he provide great company, once again having two cars also made the transport arrangement far easier, preventing a rather time consuming rail transfer which I had originally been expecting to undertake. 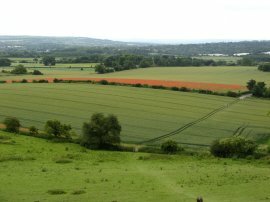 We met at the small car park by the Ranscombe Farm Reserve at the edge of Cuxton before driving over to Otford station for the start of the walk. 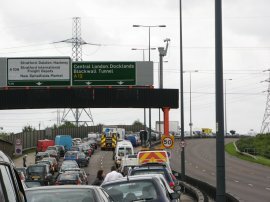 The day had got off to a bit of a slow start as the A12 near home was blocked by an accident and I spent the best part of 25 minutes at a complete standstill, photo 1, before the carriageway was re-opened and it was a little after 10am when we finally set off from Otford Station. 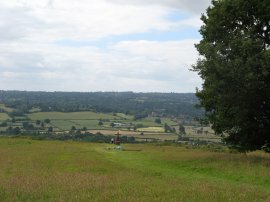 After a short stretch of road walking through the outskirts of Otford we reached the first ascent of the day along the fairly steep footpath up Otford Mount, photo 2. Halfway up we met a couple who were walking the North Downs Way on consecutive days, although there destination for the day was Wrotham, only about five miles down the path, a very gentle days walking. At the top of the mount the route crosses a couple of fields towards Birchin Cross Road before heading along a variety of tracks and chalky footpaths, photo 3, over the hills towards Kemsing Downs. 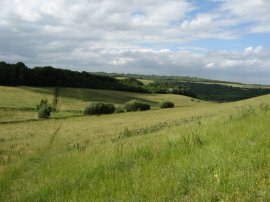 The route passes over Kemsing Downs, from where there were good views across to the Greensand Ridge, photo 4. 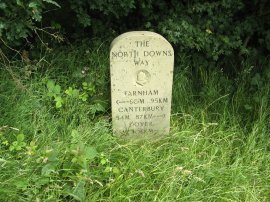 A little further on there was another concrete North Downs Way distance marker, photo 5, showing that I had now walked 60 miles from the start of the path at Farnham. Leaving the downs the route continues ahead, running through the odd patch of woodland and besides the occasional field on towards Colman's Ash Lane. 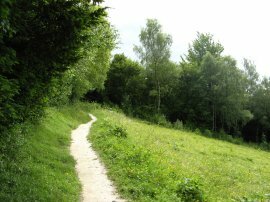 Here the route turns left for a short distance before taking a footpath that continues ahead to reach Birches Wood. Here the route turns to the right, crosses a road, and starts heading downhill towards the base of the hills towards the line of poppies that can be seen in photo 6. 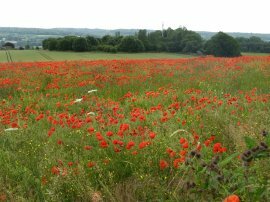 Reaching a road by the field of poppies, photo 7, the North Downs Way turns to the left to run along a hedge lined byway that is also part of the Pilgrims Way. This generally straight and level section of path is followed all the way to the outskirts of Wrotham. Whilst we were on the path we were passed by three motorcyclists but generally the path seemed little used by other traffic. 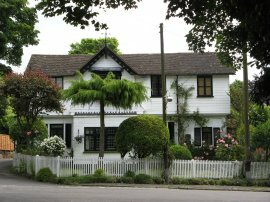 Reaching Wrotham the route continues ahead along the now surfaced Pilgrims Way, past the attractive house in photo 8, along to a short stretch of footpath off to the left which runs up to join the A20 for a short distance which carries the route across the M20 motorway, photo 9. 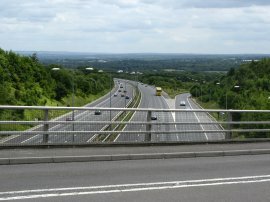 Once over the motorway the route turns to the right and heads down another road stretch of the Pilgrims Way. The path follows the road for some distance although for much of the time this is along footpaths that run just inside the fields that run either side of the road rather than on the road itself. 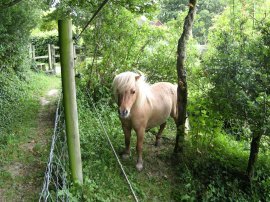 In one of the fields there was a very small miniature pony, photo 10. 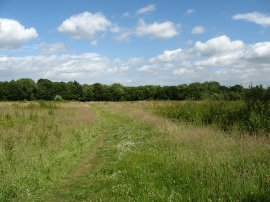 The route heads across the National Trusts Wrotham Water site, photo 10, along more open grassy field side paths that head gently uphill over the undulating edge of the downs before turning and heading more steeply back uphill through Hognore Wood to the top of the downs. Reaching the A227 Gravesend Road the route turns right down Vigo Hill, past a now closed pub, before turning right along a track into Trosley Country Park. Here we deviated slightly from the route to have a cup of tea at the visitors centre and eat our lunches. I was also able to buy a couple of bottles of water as I had forgotten to fill my water bottle at the start of the day. Rejoining the North Downs Way the route then heads for about a mile along a broad tack that runs through woodland, reminiscent of much of the path on the stage between Guildford and Dorking. 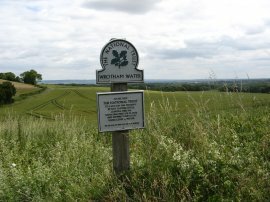 The route then turns to the right along a track that runs back downhill again to rejoin the Pilgrims Way on a track running close to the bottom of the downs. 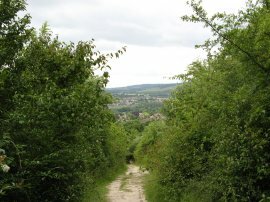 The route links up with the route of the Wealdway for about 20 yards and continues ahead for some distance before turning to the left, then right, to commence another ascent, the third on this stretch, back up to the top of the downs by Holly Hill Lodge. 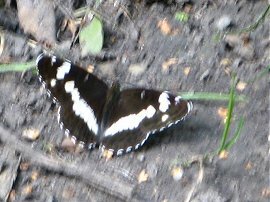 For a brief while it was possible to see along the Medway Valley, down towards the Medway Bridge, photo 12, close to where the car was parked. After a longer stretch of path through the woodland the route turns to the left and heads across a valley, photo 16, towards North Wood. 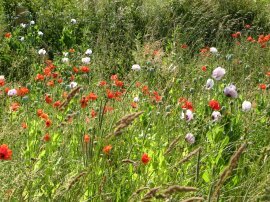 Around the field edges there were a large number of poppies, photo 17, a flower I have seen a lot of this year, including a considerable number of purple flowered poppies mixed in with the more common red varieties. Having passed through North Wood the route heads downhill through Bush Valley, which at the time was planted with a large crop of Barley, photo 18, before heading on to reach a road in the tiny hamlet of Upper Bush. 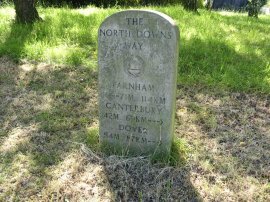 In Upper Bush there was another of the concrete North Downs Way distance markers, photo 19, this time showing I had now walked 71 miles from Farnham which made the distance I had walked less than that which is left to do for the first time, Dover now being only 54 miles away. 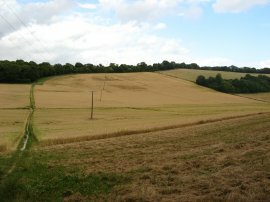 From Upper Bush the route bears to the right across a field and crosses a road on the edge of Cuxton before heading uphill on a footpath that leads to a bridge over some railway lines. Once over the bridge the path heads back out over fields, photo 20, towards the Ranscombe Farm Reserve. The path heads gently uphill, curving to the right before crossing over some more level ground to join the driveway to Ranscomber Farm where the route turns to the right to head down towards the parking place besides the A228. 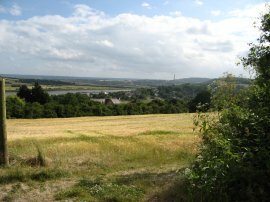 Despite the proximity of the Medway Valley this had remained hidden from view almost throughout the day although we did catch a brief glimpse of the river, photo 21, just before we rounded the final bend to the car park. 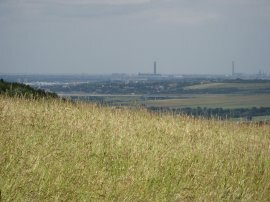 Ahead in the distance we could see the North Downs, running off down past Bluebell Hill and beyond. Reaching the car we had walked 15.6 miles, once again all along the North Downs Way, apart from the short diversion at Holly Hill. 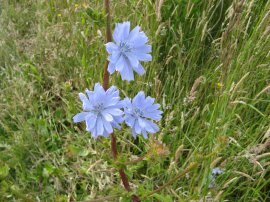 I had really enjoyed this walk, we had gone at a good pace, the countryside was generally pleasant with a number of open stretches with good views and I have made real progress along the path.